Barefoot Hippie Girl: What Moments Do You Struggle to Enjoy? What Moments Do You Struggle to Enjoy? One of my online friends, Brittany, asked a question a couple weeks ago. 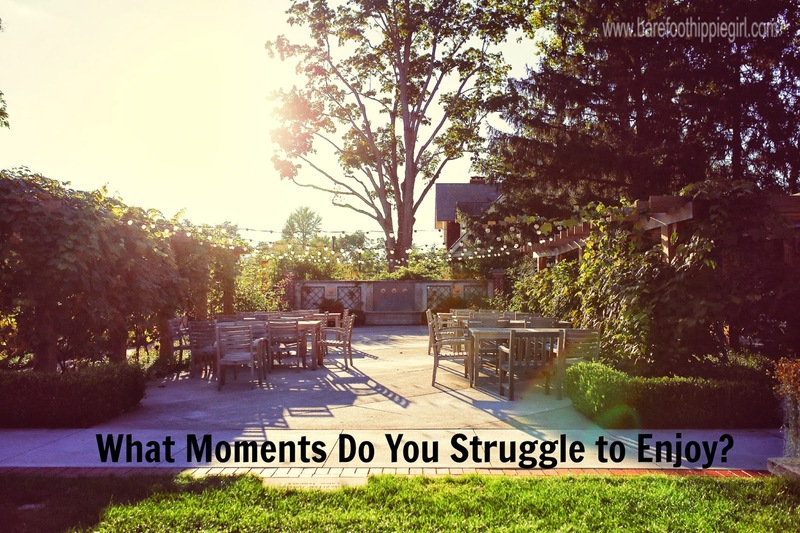 What moments do you struggle to enjoy? (here) Ever since I read that question I have been pondering it. The moments, the struggle, the why. Right here, this moment, my kitchen sink is piled high with dirty dishes. Pans and bowls from this morning's baking and cooking spree. But I am sitting here, with my cup of tea and my laptop, and I am enjoying this moment. I am enjoying this chunk of quiet I have carved out daily to write. I rarely struggle to enjoy my afternoon's writing sessions. I rarely struggle to enjoy my afternoon time because I have done most of my chores first or I have the time to do them afterwards. I was raised in the work first, play afterwards frame of mind. Since I enjoy writing so much, I put it in the play category (second) even though it is generally a lot of work. Who is placing these restrictions on me? It's me, myself and I. Not my husband. Not my kids. Not even most of my acquaintances, family or friends. My husband is always grateful and amazed by what I do. He has never given me a list of what he thinks I should accomplish on any given day. I rarely struggle to enjoy my afternoon time because I view it as a ministry more than a hobby. It is not making me any money, but writing is something I feel God has called me to do. Thursday, when you are actually reading this, I will be on an airplane or at brunch with a friend in South Carolina or I will be attending a blogging conference. Without husband. Without kids. (hopefully) Without guilt. Why would there be any guilt? We prayed as a couple about me attending. We saved our dollars so I could go. I am going with my husband's encouragement and blessing and 100% support. I am going in order to meet friends and renew friendships. I am going for good teaching. I am going to learn skills to sharpen my saw and hone my craft. I struggle to enjoy moments that are solely for my benefit and enjoyment. I struggle to enjoy relaxed moments. I feel compelled to do and go. I struggle to enjoy moments with my husband, especially when they are so few. Because they are so few. And I want more. I am not content. I struggle to enjoy church. Between kids wiggling, Meres spitting on LC's feet to "wash them" and belting out Fishers of Men during the sermon (which actually means that she was listening). And the maneuverings. And machinations. And politics. And the person handing me $20 to buy Meres new shoes-because her current ones have a good clicking-tapping quality about them. True story. One of the most frequent phrases I read on the internet is "don't judge." It makes me grimace. Why do we feel the need to admonish people not to judge us? Maybe because our own inner voices of judgement are clamoring so loudly. We are burdened with our own guilt and assign that guilt and judging to others. What are these judgmental voices based on? Sometimes they are based on ideas of what we genuinely feel we need to do-the things that are our call or job. 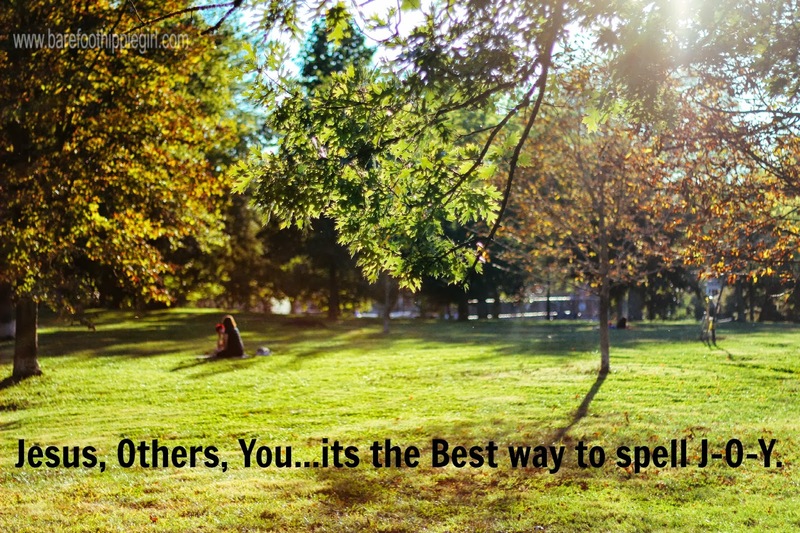 The reconciliation of the need to do it all and the fact that there are only so many hours in a day or week. Often it is just me holding myself hostage to my own expectations. I am robbing myself of joy and enjoyment. Sometimes these judging voices are words that people have spoken to us at one time or another. Words that were hurtful and out of line. Words that have shaped our actions. I used to write on Facebook the things I was doing in a day. It was a way to encourage myself and check things off my to-do list. Someone told me that I should be doing all the things I write about. It's my job because I am a stay at home wife and mother. Cooking, cleaning, home schooling, writing, reading, bathing babies, feeding babies, running, swimming, baking bread, baking cookies, making nutritious meals for my family every day, grocery shopping, laundry, sewing, gardening, yard work. Everything. Because I am a stay at home mom, and this is my job, and it is what I am supposed to do. Never mind that she was also a stay at home mom and rarely did most of those things. So, now when I am tempted to give my chores a lick and a promise I hear her voice in my head, and I feel guilty and burdened. Someone else told me that were she in my circumstances she would not feel the need to have a woman come in to clean and cook several afternoons a week; or have a live-in tutor for her kids; or send her kids off to school daily; or have groceries delivered to her door. But, she isn't in my circumstances, which is why she does these things. But, I should not feel that I should do any or all of these things. Imagine the guilt that stalked me as I hired a girl a couple of times to watch my kids so I could do paperwork for our business, and plan for a retreat, and write in peace, and plan our school year! Theoretically those things are all my job and/or my call. I should be able to do those things even with four kids around 24/7. I felt guilty even though I cleaned my house thoroughly before I left all 3 times, made dinner beforehand, and did everything that could possibly be referred to as my responsibility-except actually watching my kids for those 18 hours (over 3 days). Those days were very productive and peaceful, and a balm to my soul. Sometimes the judging voices in our heads are neither our voices nor the voices of real things people have said to us. Sometimes the judging voices, the voices of guilt, are merely the voices of what we think people think about what we are doing or not doing and our motives. The latest time I read this don't judge phrase was earlier this week. A girl said her mom took her laundry home to wash for her. And she clarified it by saying "don't judge." I thought, "don't judge?" What is probably going through most of our minds is the wish that our moms lived close enough to take our laundry. That would be so helpful. I was certainly not thinking, "What a loafer for not doing her own laundry. Why can't she get her act together?" I wonder if at the heart of some of our guilt, of some of our lashing out and admonishing others to not judge us, is the fact that we judge others without mercy. We don't want others to measure us by the same standard we use against them. I wonder if at the heart of our guilt is the struggle to be more Christlike and unselfish, and trying to balance the idea of what in fact Jesus would do in these situations. As Christians we don't want to drink the world's Kool-aid. The Kool-aid of I deserve this. We want to think Biblically. Does this mean that there is no room for pleasure? No room for moments of pure enjoyment? Even God looked at His creation with a sense of satisfaction and said "this is good". What's the solution? There has to be a solution. -Embrace our liberty in Christ and rely on the Holy Spirit for direction on what to do and be. Walk in the peace and confidence of His leading. Make our choices and let go of the need for approval of any beyond Christ and (if applicable) our husband. -Root out the envy and bitterness in our own heart. Forgive and stop competing. Stop devouring. That is what the judging is. -Love. Get our focus off ourself and on to others. Love your neighbor. Joy. J-O-Y. Jesus. Others. You. It's the best way to spell joy. If we prioritize life in this way, we are seeking and obeying God's leading, which gives freedom from guilt. By putting another's needs before our own, we are proactively dealing with the siren call of our own selfish hearts. Then there is no need to not enjoy life as it comes our way. There is no need not to make the most of the opportunities-even fun and relaxation-that God leads us into. Wow! This is the longest post I have written in a while. My heart splatted out there for all to see. What do you think? What moments do you struggle to enjoy? Why? What can you do to change that?